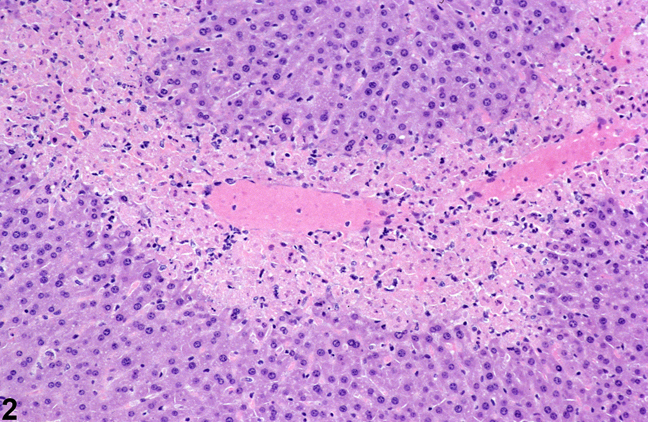 Necrosis-sharply demarcated centrilobular necrosis in a male B6C3F1 mouse from a subchronic study. 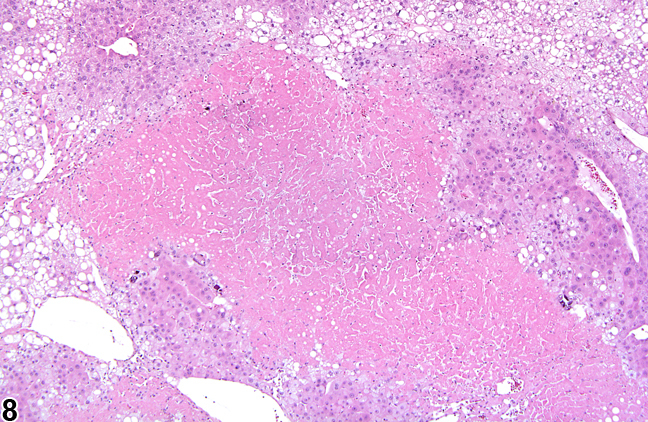 Necrosis-patchy areas of coagulation necrosis in a female Swiss Webster mouse from a subchronic study. Necrosis-patchy areas of coagulation necrosis in a female Swiss Webster mouse from a subchronic study (higher magnification of Figure 3). Necrosis-hemorrhagic necrosis in a Swiss CD-1 mouse from an 18-month study. Necrosis-focal necrosis with fatty change in a male B6C3F1 mouse from a chronic study. 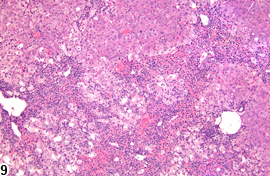 Necrosis-focal necrosis with fatty change in a male B6C3F1 mouse from a chronic study (higher magnification of Figure 9). 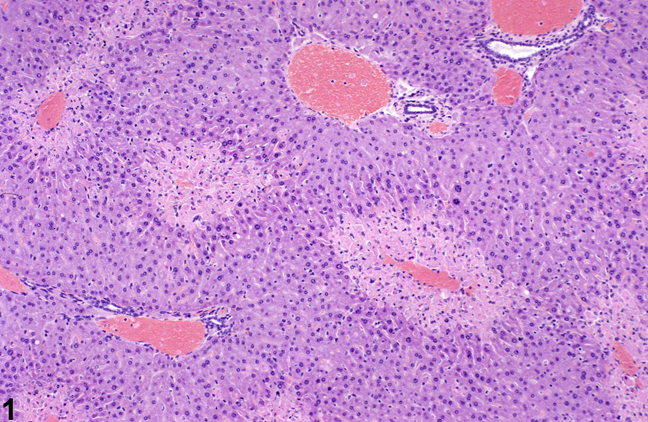 Necrosis-hepatocyte necrosis accompanied by hepatocyte degeneration in a male B6C3F1 mouse from a subchronic study. 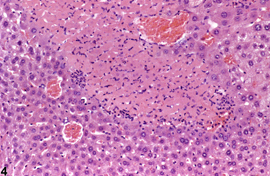 Necrosis-hepatocyte necrosis accompanied by hepatocyte degeneration in a male B6C3F1 mouse from subchronic study (higher magnification of Figure 11). 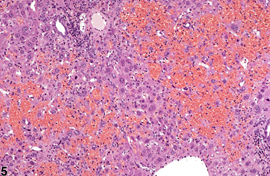 The extent, pattern, and morphologic features of hepatocellular necrosis depend on the degree of metabolic activation of hepatotoxic xenobiotics, host response to the toxicant, dose and duration of xenobiotic exposure, and timing of liver sample evaluation after dosing. Classical coagulation necrosis is typically caused by ischemia or infarction, and tissue architecture is somewhat maintained because lysosomal enzymes responsible for proteolysis are denatured. 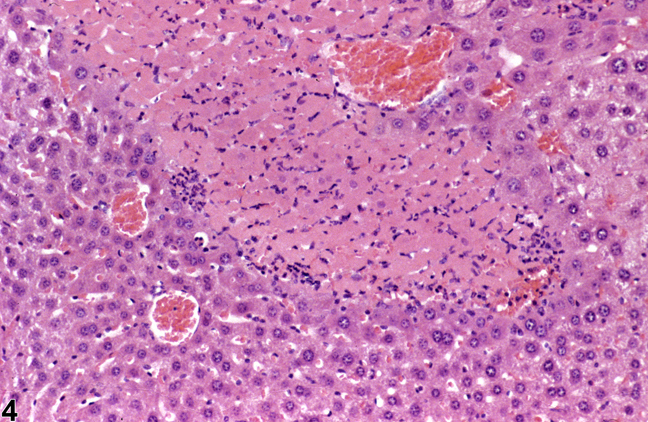 Another form of necrosis, liquefaction necrosis, may result in cellular dissolution and loss of cytologic architecture. 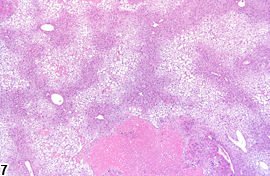 Changes that may accompany necrosis include hemorrhage, fatty change, cytoplasmic vacuolization, cytologic degeneration, and inflammatory cell infiltration. 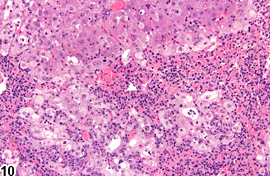 Figure 1 and Figure 2 represent sharply demarcated centrilobular necrosis with loss of hepatocyte cytologic detail. Figure 3 and Figure 4 represent irregular patchy areas of coagulation necrosis with early infiltration of inflammatory cells. 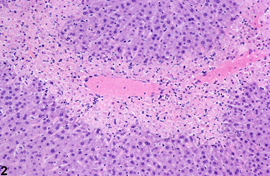 There is no distinctive lobular pattern to this necrosis. 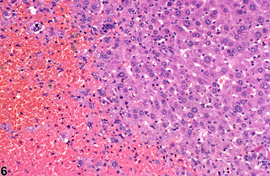 Figure 5 and Figure 6 represent an example of necrosis characterized by loss of hepatocytes and replacement with erythrocytes. 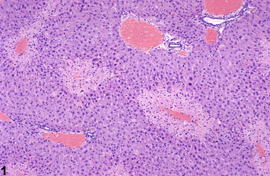 This is an example of hemorrhagic necrosis. Figure 7 and Figure 8 represent focal necrosis associated with fatty change. 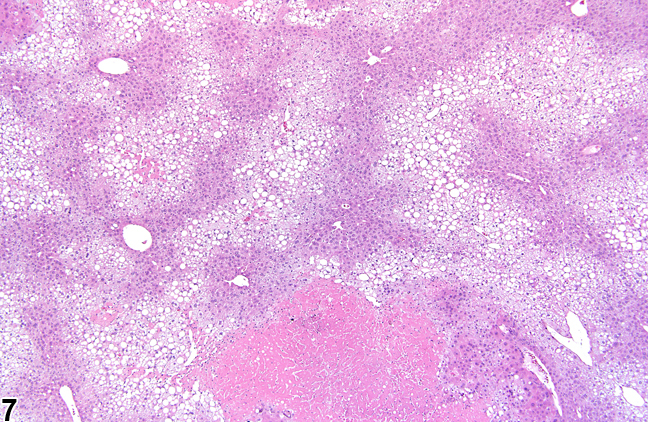 The patches of necrosis (see Figure 8 , bottom center) are hypereosinophilic, and the fatty change is centrilobular with extension well into midlobular areas. Figure 9 and Figure 10 represent a diagnosis of hepatocyte necrosis accompanied by hepatocyte degeneration, microvesicular fatty change, nuclear pyknosis, and inflammation. 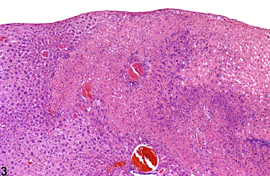 “Degeneration” is a term often used to indicate reversible cell or tissue damage and is considered to be a precursor to necrosis. Because the presence of the inflammatory response is extensive, an additional diagnosis of inflammation (cellular infiltrate) to capture the ongoing process with more fidelity may be appropriate. 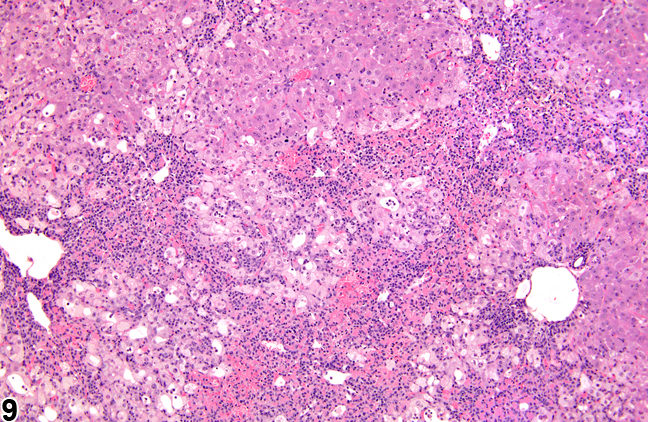 Necrosis should not be subclassified based on type, with the exception of single-cell necrosis. 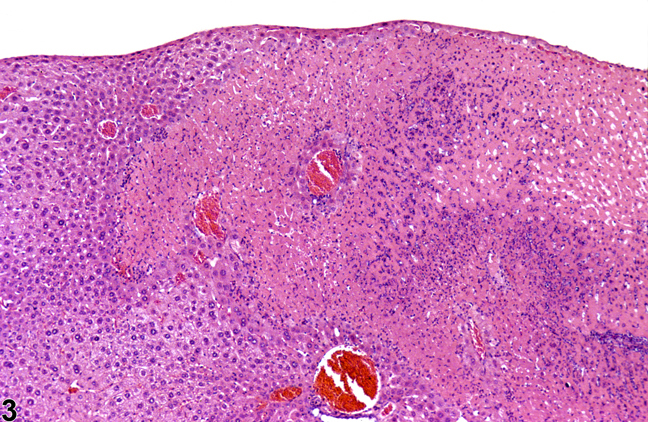 For a given xenobiotic, dose and animal variability in response can influence whether hepatocellular necrosis is panlobular or centrilobular and whether it is focal or occurs in extensive irregular patches. If the fundamental process is the same, the lesion(s) should be recorded simply as necrosis and assigned a severity grade. 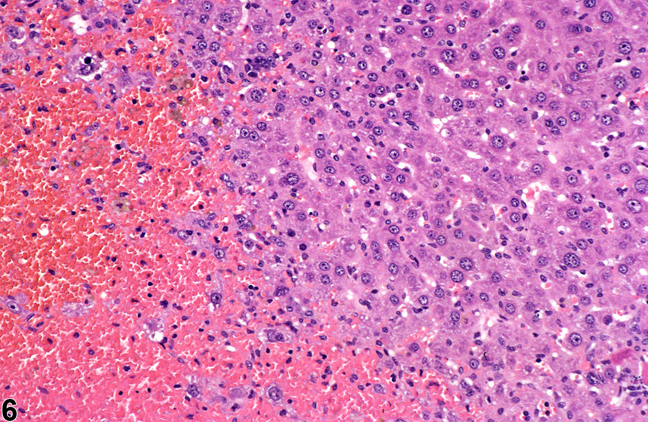 The pattern and other features of the hepatocellular necrosis should be described in the pathology narrative. Splitting out diagnoses too finely will result in complicated incidence tables and may compromise appropriate interpretation of any induced toxicity. When accompanying changes such as fatty change or inflammation are sufficiently extensive, separate diagnoses may be warranted with severity grading and discussion in the pathology narrative. Since degeneration is considered part of the continuum of changes involved in the necrotic process, it should not be diagnosed separately when present with necrosis. However, degeneration without necrosis may occur at exposure levels below doses that cause necrosis and thus may warrant a separate diagnosis. 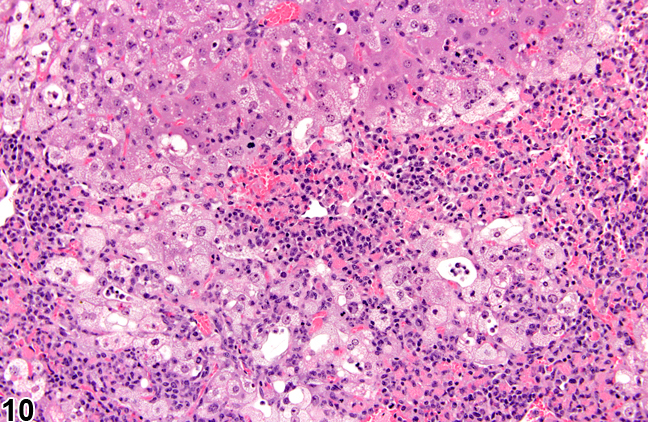 In some cases, hepatocellular necrosis can result in cavernous, blood-filled spaces within the hepatic parenchyma. These blood-filled spaces should not be diagnosed as hemorrhage because they are secondary to necrosis. Greaves P. 2007. Histopathology of Preclinical Toxicity Studies: Interpretation and Relevance in Drug Safety Evaluation, 3rd ed. Elsevier, Amsterdam. Eustis SL, Boorman GA, Harada T, Popp JA. 1990. Liver. In: Pathology of the Fischer Rat (Boorman GA, Eustis SL, Elwell MR, Montgomery CA, MacKenzie WF, eds). Academic Press, San Diego, 71-94. Evans JG, Lake BG. 1998. The digestive system II. Hepatobiliary system. In: Target Organ Pathology (Turton J, Hooson J, eds). Taylor and Francis, London, 61-98. Harada T, Enomoto A, Boorman GA, Maronpot RR. 1999. Liver and gallbladder. In: Pathology of the Mouse: Reference and Atlas (Maronpot RR, Boorman GA, Gaul BW, eds). Cache River Press, Vienna, IL, 119-183. Hardisty JF, Brix AE. 2005. Comparative hepatic toxicity: Prechronic/chronic liver toxicity in rodents. Toxicol Pathol 33:35-40. Haschek WM, Rousseaux CG, Wallig MA. 2010. Fundamentals of Toxicologic Pathology, 2nd ed. Academic Press, San Diego, 197-235. National Toxicology Program. 1993. NTP TR-394. Toxicology and Carcinogenesis Studies of Acetaminophen (CAS No. 103-90-2) in F344 Rats and B6C3F1 Mice (Feed Studies). NTP, Research Triangle Park, NC. National Toxicology Program. 1998. NTP TR-468. Toxicology and Carcinogenesis Studies of Oxazepam (CAS No. 604-75-1) in Swiss-Webster and B6C3F1 Mice (Feed Studies). NTP, Research Triangle Park, NC. National Toxicology Program. 2012. NTP TR-571. Toxicology and Carcinogenesis Studies of Kava Kava Extract (CAS No. 9000-38-8) in F344/N Rats and B6C3F1 Mice (Gavage Studies). NTP, Research Triangle Park, NC. Thoolen B, Maronpot RR, Harada T, Nyska A, Rousseaux C, Nolte T, Malarkey D, Kaufmann W, Kutter K, Deschl U, Nakae D, Gregson R, Winlove M, Brix A, Singl B, Belpoggi F, Ward JM. 2010. Hepatobiliary lesion nomenclature and diagnostic criteria for lesions in rats and mice (INHAND). Toxicol Pathol 38:5S-81S.